The countdown is on for the launch of Space Shuttle Atlantis, opening June 29 at NASA’s Kennedy Space Center Visitor Complex. Shuttle Endeavor recently completed its historic trip through the streets of Los Angeles to the California Science Center. 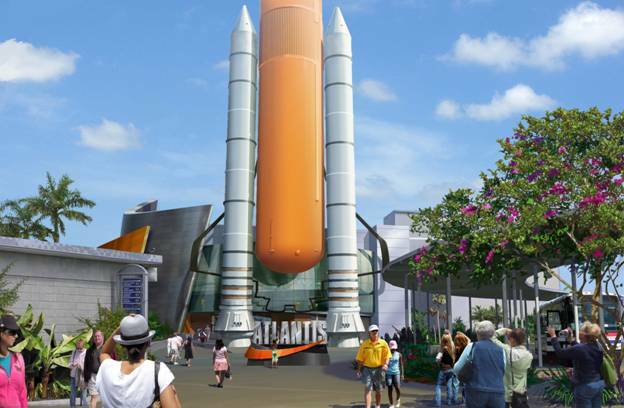 This one-of-a-kind experience delivers extraordinary access to Space Shuttle Atlantis – from only a few feet away, guests of all ages will get an up-close, 360-degree view of the orbiter, the wear of its 33 missions apparent on its protective external tiles. The spacecraft will be dramatically showcased as if it were in space – as only astronauts have had a chance to see it departing from the International Space Station. Atlantis has been elevated 30 feet and rotated at a 43.21-degree angle, its payload bay doors will be open and its Canadarm (robotic arm) extended. Space Shuttle Atlantis features state-of-the-art multimedia presentations and more than 60 interactive exhibits and high-tech simulators. Space Shuttle Atlantis tells the incredible story of NASA’s 30-year Space Shuttle Program, and its most notable accomplishments: the building of the International Space Station and the launch and maintenance of the Hubble Space Telescope. One of the most complicated and sophisticated pieces of equipment ever built, Space Shuttle Atlantis was a vehicle that launched like a rocket, flew in orbit like a spacecraft and landed on a runway like a glider. The Space Shuttle Program transformed the way humans explore space and look at the universe. And there is no better place to tell that story than the home of human spaceflight, Kennedy Space Center, where all 135 space shuttle missions were launched, from 1981 to 2011. Now visitors of all ages can experience the legacy of the space shuttle, up close and personal. This entry was posted on April 18, 2013 by News in Kennedy Space Center, Tourism and tagged Atlantis, Atlantis attraction, Donna Balancia, Kennedy Space Center, KSC Visitor Complex, Shuttle Atlantis, shuttle orbiter on display.